For the last couple of months I became interested in the Paleo nutritional system, as most people who follow it appear to be very fit. It got me curious. It also did not hurt that Dr. Loren Cordain, the man behind the Paleo approach is now part of our extended family: Phil’s sister recently married his uncle-in-law. Small world! Anyway, fully aware of my self-inflicted moratorium on cookbooks in 2015, I did what a sensible food blogger would do and bought some Paleo-oriented publications last November. As you can see, I have an amazing ability to outsmart myself. If you have any interest in the subject, I highly recommend Well Fed2, The Frugal Paleo Cookbook, and Nom Nom Paleo Food for Humans. Don’t worry, the Bewitching won’t turn into a Low-carb, Paleo, Vegan, or “insert any diet system here” blog. There will be bread, pasta, rice, couscous, a lot of meat, and sweets. Omnivore, and loving it! – has always been my motto, and that isn’t changing. But the truth is that one can cook a ton of tasty stuff under the Paleo approach. Plus, it’s all reasonably low in carbohydrates and high in protein, a kind of eating I’ve favored for the past 4 or 5 years. This soup is a perfect example of deliciousness that is low in fat, low in carbs, and keeps me satisfied from lunch until dinner. As you may notice, I included a cheese crisp that would not be blessed by Paleo folks. It would make this version Primal, I suppose. Still hanging around caves, but with a little more pizzazz, sipping the occasional wine from a coconut shell. The secret for this smooth and delicious soup is the use of ginger and coriander as background spices. The soup starts with a simple saute of onion and garlic, then ginger and coriander in powdered form are added, releasing their flavors in the hot oil. Next, zucchini pieces join the party, and the whole thing will be simmered for about one hour in your favorite type of broth (chicken, veggie, or beef). 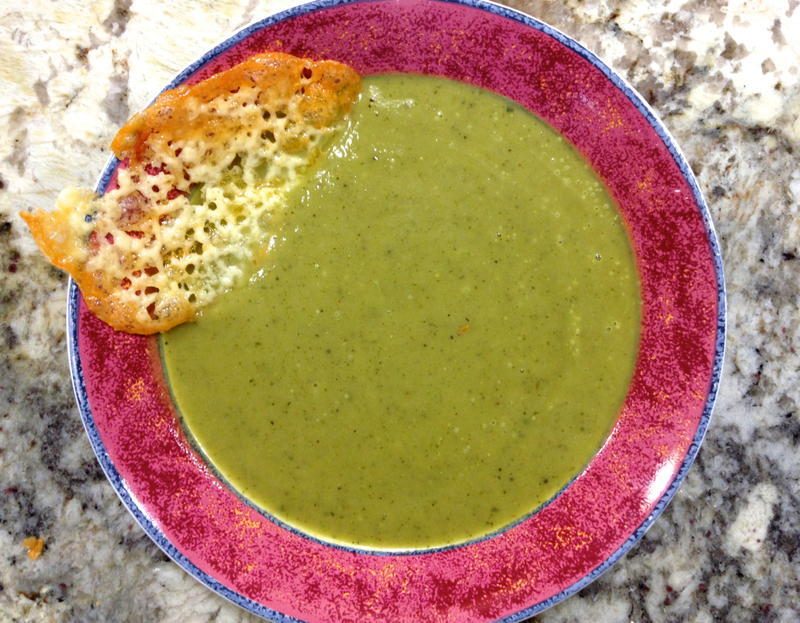 When the zucchini is super tender, the soup is blended and ready to be enjoyed. 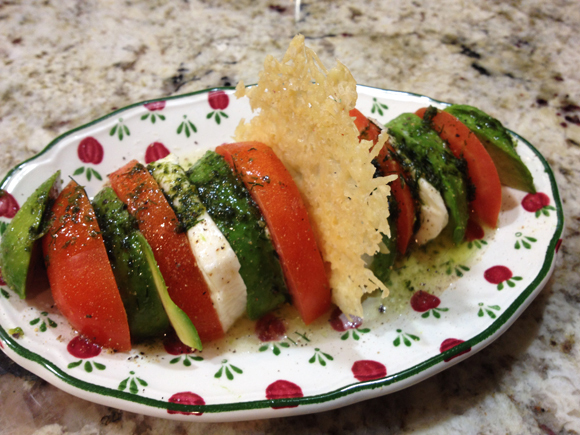 You can find the recipe in Melissa’s site with a click here. It is also in her cookbook Well Fed2. I’ve made this soup almost as many times as I made Mike’s Creamy Broccoli Soup. Sometimes I used chicken broth, sometimes a mixture of chicken broth and water. A squirt of lemon juice right before serving is a nice touch too. 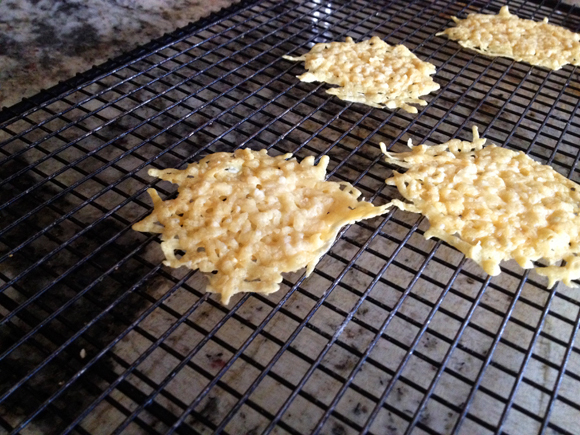 Cheese crisps pair very well with the zucchini. To make them I followed the method that Mike described in his original post for the broccoli soup. On the first photo of this post, I used a Cheddar type cheese, and in the photo below I went with Parmigiano-Reggiano. I like Parmigiano better, because it releases less oil as it bakes, and has that unique sharpness that contrasts very well with the silky soup. I confess I was afraid of making the crisps from scratch, due to traumatic experiences of a distant past. At that time I tried making them on a non-stick skillet on the stove top, and ended up with a complete mess, pretty much inedible. But preparing them in the oven was a totally different experience. 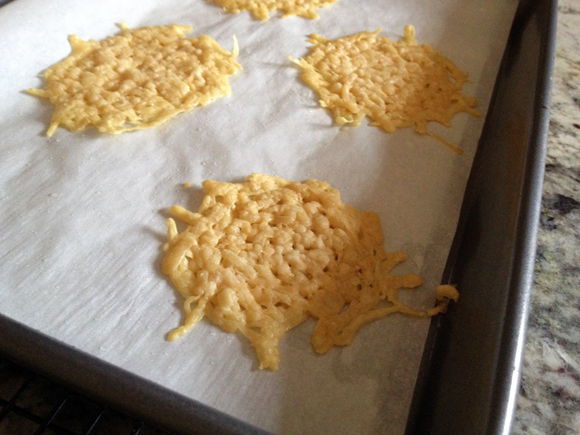 First, place parchment paper over a baking sheet (or use Silpat). 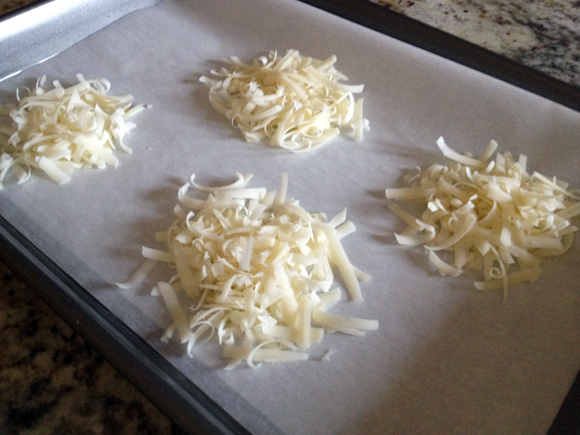 Then add small amounts of shredded cheese of your choice separated by about 1-inch. They won’t spread too much, but better safe than sorry. Watch them carefully, because they will go from perfect to burned in a matter of seconds…. Carefully transfer them to a rack, so that they get crisp. You can use them right away, or store for later. Dressing was avocado oil infused with basil (he used the handy cubes from Dorot), a little lemon juice for good measure. 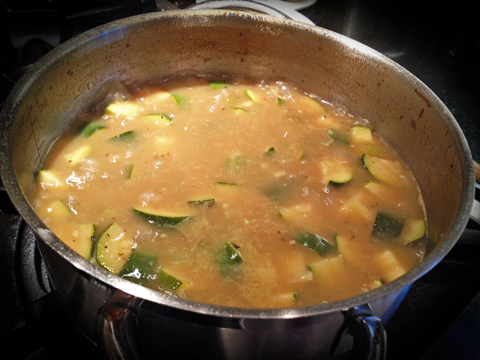 But back to the zucchini soup: a real winner of a recipe. I normally make a batch in the weekend, and it becomes my lunch for three days in the following week. If I don’t have cheese crisps I top it with toasted almonds, or a diced hard-boiled egg. Simple, and quite nutritious. “The ONLY way to eat is seasonally, locally and sustainably. If you live in a place where snow falls and kills crops and animals starve you should eat snow and only snow. To do anything else will cause immediate and untimely death”. (from Sarah Yates, A Little House in the Hills). ONE YEAR AGO: Sweet Fifteen!